Summer fresh produce has some great colors. 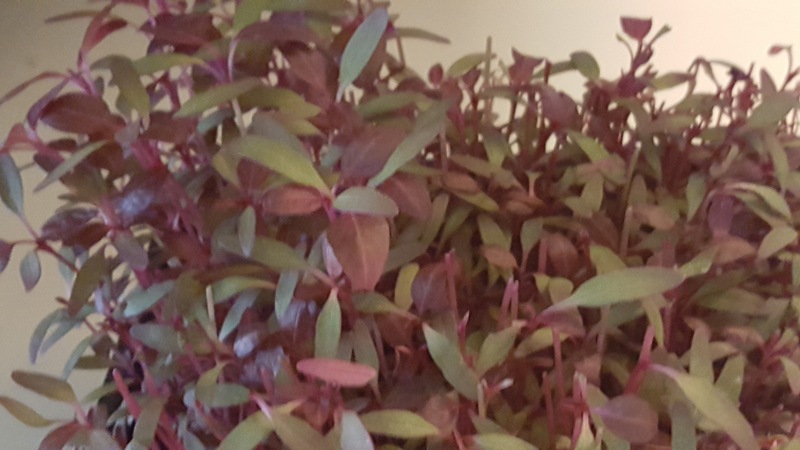 The spring into summer season gets lovely pink/purple/green/red from rhubarb, strawberries and this year’s new to me: amaranth shoots. First above, an old favorite Rhubarb and Strawberry Oatmeal Cobbler. Mix all ingredients and bake at 350 degrees for 30 minutes. It seemed rather dry to me, so I added 1 cup water after baking and let it absorb the water while cooling. 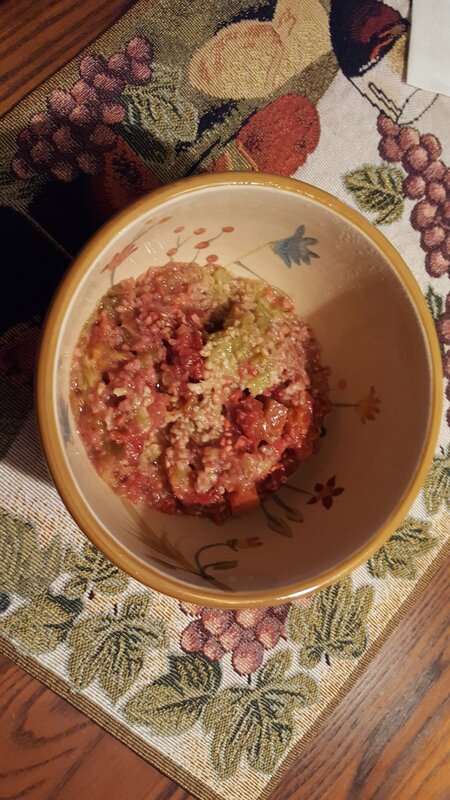 Perhaps the rhubarb was a bit dried out, and I did take the starwberry juice for my shrub. I also noticed the oats absorb lots more water than my usual ones. When I was growing up, this would have been dessert. We had it for breakfast today. Next up, Chive Blossom Vinegar (in the jar) and Strawberry Shrub (in the cup). The vinegar was made by soaking a few handfuls of chive blossoms in distilled white vinegar to cover, for two weeks. The orginal mention of this pretty use of my chive plant was made to me by my friend Melissa Mead. After the two weeks I strained it. The blossoms are a pale purple when picked, and the vinegar was clear, but as you can see, the results are a vivid pink/red! It has a lovely onion flavor. I used it as part of a salad dressing last night. The shrub was made with juice from my earlier sugared berries, mixed with an equal amount of cider vinegar. 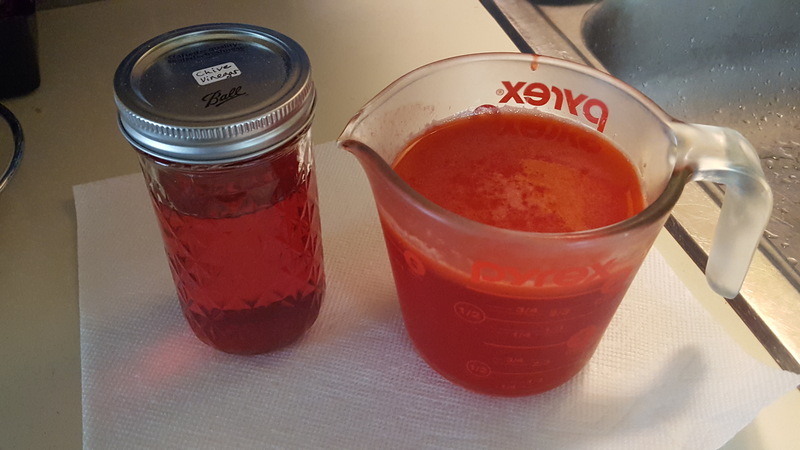 The quart of berries yielded about 1.25 cups liquid after two days in the ‘fridge, so I have about 2.5 cups of shrub in the picture. I use it to mix with seltzer water or white wine as a spritzer. I also drink it straight. It is only a bit tart. It mostly has a sweet, fresh and juicy strawberry flavor. It lasts for months in the “fridge. I like mine cold, but you don’t have to keep it there. The original point of shrubs was to preserve fresh produce in a time before refrigeration. My newest love, fresh amaranth shoots. Another vivid green to purple plant. The taste is fresh corn crossed with a grassy green note. I’ve been tossing mine on top of fresh salads. The growing tray full above was purchased from Lovin Momma at the Schenectady Greenmarket.